Fun little bead set in bright summery colors. Six donut shape dotted beads. Four pretty little aqua colored transparent beads encased in clear. Beads are donut shaped and measure approximately 10mm from hole to hole. 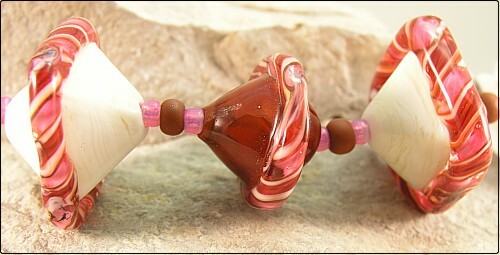 Three bead set in yummy neopolitan ice cream colors. Two are crystal shaped and one bicone. All are wrapped with handmade twisty. Bright summery yellow bead set with raised clear bumps on four beads and melted smooth on one. I don't know about you, but I am ready to see the spring crocus in this color come up! Donut shaped beads approximately 8mm from hole to hole.